Have a friend you keep meaning to visit but never get around to it? I do and I finally visited mine on a weekend trip from the Bay Area to Los Angeles. Thirty-six hours doesn’t seem like a lot of time for a vacation, but it truly felt like one. Round trip plane ticket from SJC to LAX ($137.80), purchased about one month in advance. The sweet spot for getting the best ticket price is about four to six weeks in advance of the date you want to fly out. I used Kayak.com and Hipmunk to compare prices, then cross referenced the best ones I found with the airlines’ actual websites. Flying out early (7:30am) Saturday morning rather than Friday night got me a better deal. Also flying into a major airport shaved off a few hundred dollars, luckily my friend was willing to pick me up there. From there, it was off to brunch at The Potholder, a local eatery. 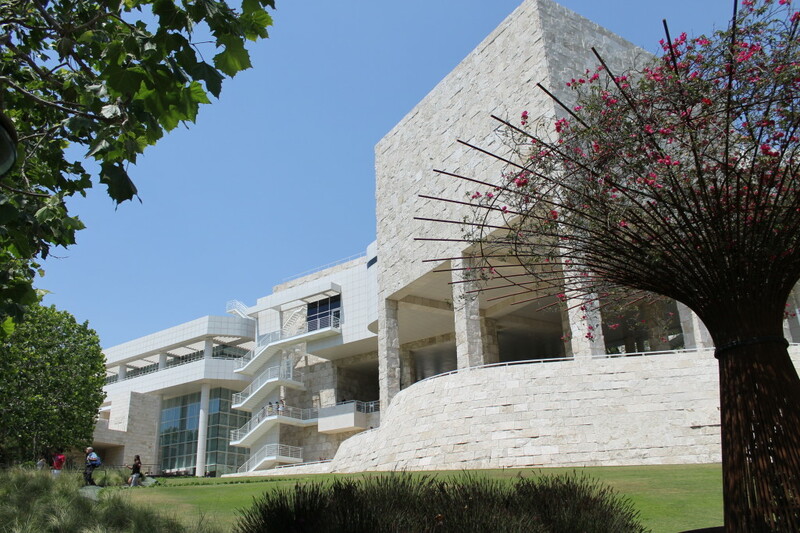 We also visited the wonderful Getty Museum, which has free entry but the parking costs $15. We spent about four hours wandering the various floors, exhibits, and gardens, so it was a good deal for the amount of time we got out of it. 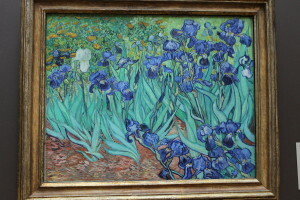 The featured artwork ranged from French wall tapestries to paintings by van Gogh. The collections were extensive and excellently curated. Even with the hot weather, we enjoyed a stroll through the gardens. They had an amazingly kept bush maze and several outdoor structures. The balconies and patios of the museum also had a great view of the L.A. skyline and surrounding area, we could even see the ocean! Because we’d eaten a late brunch and stayed at the Getty so long, we had a late lunch/early dinner at a delicious vegan restaurant called The Loving Hut. It has a few locations nationwide and I recommend it! Sunday morning I watched my friend play tennis while skirting the edge of the court to keep in the shade. Returning to the hopeful wagging tail of my friend’s dog, we took him for a walk to the beach. Then we drove to Venice for dinner at Seed and took in the entertaining sights of the strip. Sadly, there was no one at Muscle Beach, but we did see a Venice Basketball League game going on. After some satisfying gelato at Bonaventura Gelato Lounge, it was back to LAX for the flight home! In total this weekend trip cost $232.80. Lucky for me, I had a friend willing to host me (no hotel costs) and be my transportation. This mini vacation felt very relaxing because I wasn’t concerned with packing in the most sights, my goal was to spend time with my friend. This focus allowed a mental break and the two days stretched into much more than that. I definitely recommend trying this approach at least once, removing the sense of urgency can lead to getting the most out of your travels. The Weekender is a series covering travel done within the span of a weekend. This includes any time Friday thru Sunday, or in the case of holiday weekends Friday thru Monday. 1 Pings/Trackbacks for "The Weekender: From the Bay Area to L.A. and Back"